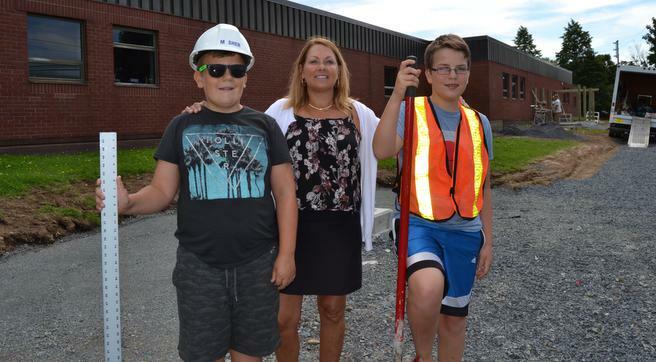 St. Agnes Jr. High has a lot of competition in its neighbourhood for being seen and appreciated by the community-at-large, what with the Mumford Bus Terminal, Walmart and the Halifax Shopping Centre being their immediate next-door neighbours. “Because of where it is, sometimes it seems to get lost in the Halifax Shopping Centre,” says Liz Greene, chair of the St. Agnes PTA, and the mother of three boys in attendance at the school. That’s all about to change, though, as St. Agnes partners with Halifax Regional Municipality to stamp out a more concrete, physical connection to the community, hoping to create a lasting legacy of community partnership for years to come. Mosher pointed out a dilapidated bike rack on the premises, which is so grown-over as to be unfit for use, and a pair of bushes that provided potential hiding places for criminals to use, as examples of things at the school that needed a facelift. But this project, dubbed the Legacy Project by the PTA, goes beyond mere practical and safety upgrades to the property. Mosher and the PTA came together with the residents in the area to design a space that won’t just serve to benefit the student body at St. Agnes, but the neighbourhood as a whole. The Legacy Project, which will be mostly completed by the time students return in September, will feature not just a new bike rack, but also a new pedestrian walk-way that connects the school to the sidewalk, a concrete assembly area, a new flagpole, nine park benches, and a wooden arbor with vines — all for the enjoyment of the students and the local residents, who will hopefully be inspired to take a bit more personal ownership of the school in their midst. It’ll also prove a boon to incoming students, like Ryan’s younger brother Adam, who is just about to start the seventh grade this fall. And the best part? This legacy is still being written. Thanks to smart tendering on the part of the city planner involved, Mosher says that the project is going to come up significantly under it’s $75,000 budget as is, so she and the PTA are interested in hearing about what more can be added to the Legacy Project to make it even better. For students like Ryan, though, if this new park allows students like him to have a better connection with the community he goes to school in, then mission already accomplished. You can throw in your two cents on the Legacy Project and potential future additions to it by contacting Linda Mosher directly, which can be done via lindamosher.ca.